Bring a luxe feel to your casual staples with this collection of Joe's jackets. The brand takes classic styles and reinvents them with modern details to create covetable pieces. Think military-style designs with cropped hemlines, textured moto styles and deconstructed denim jackets in oversized fits. 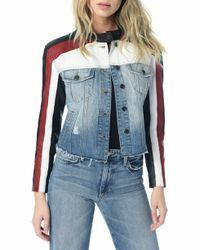 Pair one of these Joe's jackets with everything from a slip dress to your favorite jeans for a contemporary-cool effect.